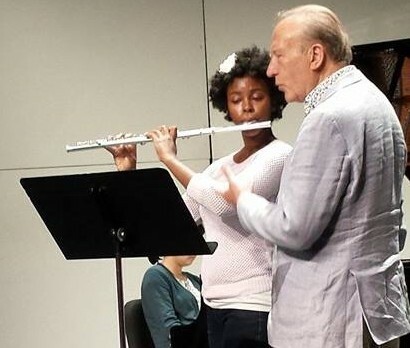 This past week, I was afforded the opportunity to study in master class setting with William Bennett at the William Bennett Summer Flute Academy, affectionately known as “Wibb Week”. Run by Professor of Music, Flute Dr. Lisa Read Wolynec, the week long course focused on performance practice, phrasing, and style, with morning sessions having a pedagogical focus. William Bennett is a force of pure musical, unique, energy. The wealth of knowledge that he brought to the works each of our cohort performed consistently reminded me why I had made the trip to Tennessee to participate in this class. The most memorable and exemplary moment for me of this when he, very animatedly, sprang over to the piano to play an accompaniment underneath a student playing the Sarabanda from the Bach Partita in a moll for Solo Flute. Using the implied harmonies of the line, he demonstrated in real time where the phrases began, and where implied dissonances, appoggiaturas, etc. lied. I already knew that harmonic understanding is important to interpret any work, but he bridged the gap for us by showing us how to apply that knowledge. There were many ways to attend the course, and no age limit is specified. Because of this there were a variety of musicians at different stages of development, each on different professional paths. The support that each of us gave one other during Wibb Week was so inspiring. Those who know me professionally know how I feel about the impacts of a positive learning environment on students. Wibb Week was an illustrative example. Discussions in Wibb’s sessions about sound, projection, and phrasing were reinforced in informative, technical morning sessions with Dr. Wolynec. In morning warm ups, she covered specific technical aspects to playing that previously arose in sessions with Wibb such as tapers, vibrato production and control, articulation. Dr. Wolynec centered these sessions around how this information can be applied to students, which was very helpful to me as an educator. Rhonda Cassano, Flautist and certified Body Mapping instructor, also supplemented the instruction during the week by offering private sessions and a group session open to all. Adaptive to my individual needs, we discussed techniques and exercises that can be applied to my specific mechanical, physiological tendencies while playing. What I would love to see more of next year are scheduled activities for collaboration among us. Our last morning session was spent with Karl Barton – who also gave a flutes of the world session earlier in the week – learning about jazz and jamming together. I would enjoy more exploratory activities like this. The experience was definitely worth the time and travel. Most artists can attest to competitiveness and its stifling of creativity and the innovation that comes from camaraderie. As artists, there is an obligation to convey through music what words alone cannot communicate. I have sometimes asked myself: if all a fellow musician can contribute are the impacts of competition and antagonism, why are they here? How can they sow the seeds of cathartic joy if they don’t live it in their daily lives? There, I found the level of support and team work very refreshing. All in all, I learned a lot of from Wibb and my fellow participants. This entry was posted in Classical, Current Events, Education, Flute, Higher Education, Music, Music Education, Performance and tagged Arts, Austin Peay State University, Flautist, Flute, Master class, Music, Performance, Tennessee, William Bennett, Woodwind. Bookmark the permalink.